January 29, 2019 0 comments on "Best Small Air Compressor Reviews 2019"
Finding a small air compressor that would conveniently fit in your small work space is tricky and can even be a difficult process. There are so many small models available in the market today and they are all claiming to be the best one. So to make things easier for you, I have shortlisted below the best small air compressor 2019 available for you to purchase today and the one that will suit your needs. These air compressors will be able to give you all the air power you need to accomplish any project you’re currently at, plus they all come from reputable brands that you can put your faith in. If you want to know what these products are, then please keep on reading below. If you’re looking for an air compressor you can use at home or at a small worksite, the Makita MAC700 is perfect for homeowners and those who just love to DIY. This is a very durable, versatile unit and most of all, compact enough that you will never have any problem storing it in your trunk or any other small places. As we know, this unit has a pretty powerful motor of 2.0 HP. It drives a combination of piston and a big bore cylinder so a large volume of air is compressed in every cycle of the piston within the cylinder. This results in an increased compression capacity as well as faster pressure recovery. It also has an oil-lubricated pump, this means more reliable operation and longer lifespan. But unlike oil-free compressors that don’t need regular maintenance, air compressors with an oil-lubricated pump can get a bit messy so you really have to maintain it, oil changes are necessary. But don’t worry, it will not be difficult with Makita MAC700 since its oil tanks have a sight oil gauge that allows you to see oil level and color through a small window found at the side of the compressor. Then you can just simply unplug the oil drain plug to drain the oil and then replace it with new oil. Also, oil-free compressors tend to overheat quickly, so if your job involves an extensive operation, you should opt for an oil-lubricated kind. It draws low amperage on its maximum pressure, this means you don’t have to worry your circuit breaker ends up tripping or overloaded. It is one of the quietest air compressors. It only has an 80 dB noise level which is barely louder than garbage disposal or a dishwasher; this is lower than most models that comes with 90 dB. 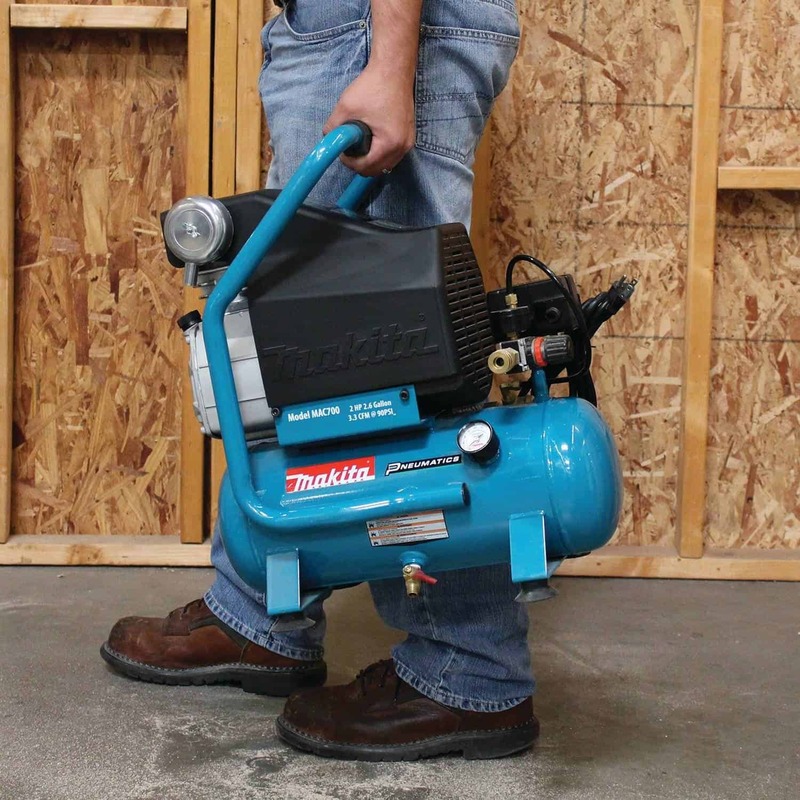 The tank of this air compressor is made of solid metal and makes it sturdy enough. Its foot has also been rubberized so you will not damage the floor when you’re dragging it. Well, we can’t deny the fact that compressors are really heavy. This one weighs 60 lbs. so it will definitely take some strength to move this around from your home to your work site. But what’s great is that its hefty weight makes this unit more stable. Makita also added an industrial quality handle which has been welded directly to the tank to make it a little bit easier to move this Compact Air Compressor, despite its weight. For most homeowners, the idea of owning a quiet air compressor seems to be like a fantasy. After all, we are used to the fact that air compressors come with a distinct loud, annoying sound. Fortunately, as the technology gets more and more advanced these days, manufacturers have found ways to make this a reality and were able to build air compressors that are not just efficient but can operate quietly at the same time. And if you are looking for one, you will be happy to know that CAT-1P1060s has been designed to be one of the quietest air compressors in the industry. At 56 dB, you can hardly hear this air compressor from another room. Of course, this unit is also extremely small and is very portable. But despite its small size, it is capable of handling most garage demands, thanks to its 1-gallon steel tank and 0.6 HP motor that can produce up to 1.2 CFM at 90 PSI. This is already enough power to handle most pneumatic tools like your spray painters, staple guns, finish nailer and so much more. Its quick recovery time is also pretty impressive. It will just take 50 seconds to fill the tank from empty to full, while it takes only 15 seconds to form 90 PSI to 120 PSI. The manufacturer has also focused on adding safety measures to this model. It comes with thermal overload protection that protects the motor from overheating. It also has a roll bar handle that protects the unit without getting in the way and keeps the unit balanced whenever you are carrying it. This is an oil-free compressor so there will be low maintenance and low mess every time you are using it. It also comes with a knob that controls the air flow, making the air stream remain steady. This is also a durable model as it has been designed to have a life cycle before wear of more than 3000 hours. It features a universal quick connector which is compatible with various attachments. Isn’t it just so frustrating having to work with a loud compressor? I’m sure CAT-1P1060s will provide convenience to you, your neighbours and your family. This Light & Quiet Air Compressor is absolutely the best choice if you are working in an environment where noise is an issue. 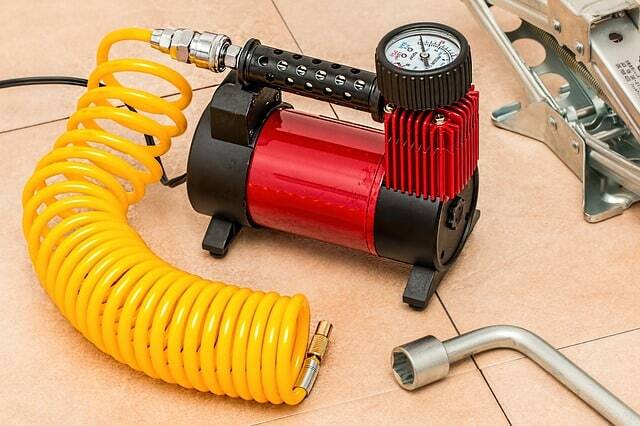 Whether you are trying to build your automotive shop or just looking for ways on how you can upgrade your already successful garage, a portable air compressor is one thing you need to seriously consider. This will be one of the most useful equipment you will ever own and will come in handy for just about any job that needs air pressure, whether inflating tires or just to power other tools. And if you are looking for the best portable air compressor, then look no further. One look at PORTER-CABLE C2002 Pancake Compressor and you will immediately fall in love with it. Its pancake design allows you to carry it anywhere without any hassle. PORTER-CABLE has also been known for sturdy construction and an efficient motor. This compressor, for instance, features an induction motor that delivers a long life and optimum performance, making it perfect for almost anything, from filling tires to firing nailers. It has a six-gallon capacity that can deliver 2.6 SCFM at 90 PSI and up to a maximum of 150 PSI. This unit is also one of the most affordable air compressors in the market. So if you can’t invest in something too expensive, this is the best alternative for you. Since this is an oil-free compressor, there will be no maintenance on its pump. It also has a low amp 120 v motor that easily starts even in cold weather. It comes with an accessory kit consisting of 13 pieces of accessories such as a 25-foot nylon hose, Teflon tape, blow gun and attachments, quick coupler, tire gauge, etc. There’s no doubt why almost everyone that has used a PORTER-CABLE C2002 Pancake Compressor were pleased with its good build and excellent performance in handling several small projects like air painting, pressure cleaning, finishing nailer, etc. It is an excellent choice for do-it-yourself hobbyists as well as small business owners. In fact, several users say that this Portable Compact Air Compressor has absolutely exceeded their expectations. DeWalt is definitely one of the leading tool makers in the world, so there’s no doubt that they are heading the way for a new generation of small air compressors. DEWALT D55140 is a small unit which perfectly combines portability, power, and performance. First of all, this air compressor comes in a lightweight and compact design. It only weighs 24 lbs. and measures only 9-inch wide, making it highly portable and easy to store. It delivers high surge performance as well as a quick recovery time. This is all because of its 2.6 amp motor that can deliver 0.75 SCFM at a rate of 90 PSI and a maximum of 135 PSI. The low amperage it draws also provides easy start-up and minimizes breaker tripping. It also has a heavy-duty one-gallon tank that is capable of trim nailing as well as other light-to-medium duty tasks. It does not require tedious maintenance or oil-change since it is an oil-free compressor. This air compressor has heavy-duty cast iron as its material which is tough enough to withstand any ordinary wear and tear, plus it comes with a roll cage to prevent any accidental damage as well as damage to its inside parts. It features quiet operation as low as 69 dB level which is pretty silent compared to similar oil-free compressors; this makes it great for indoor work such as custom installations, furniture building, finish carpentry and so much more. 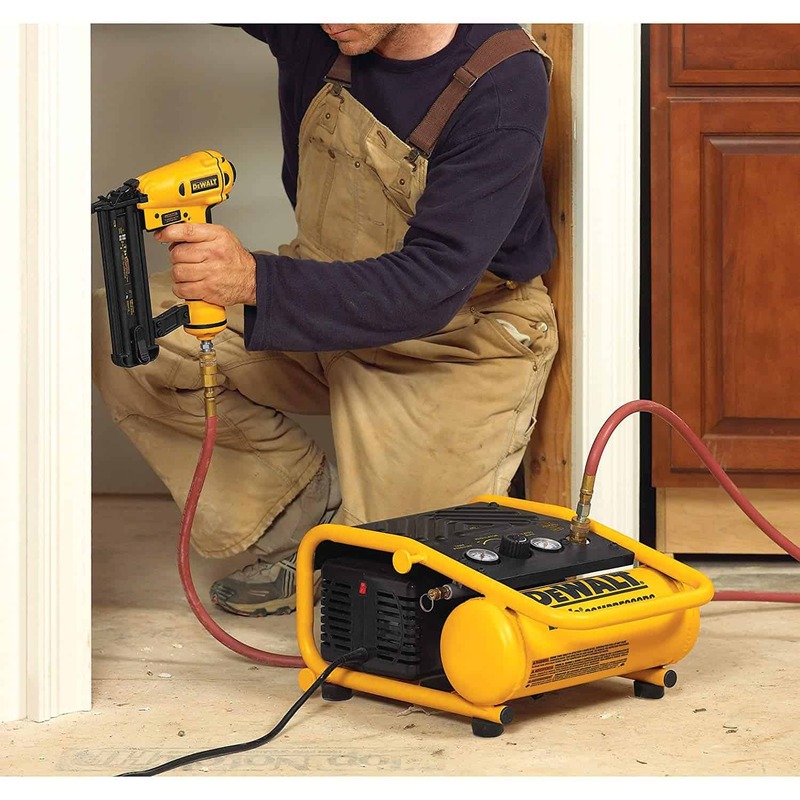 You will also be able to run various air tools and even use two framing nailers at a single time with this compressor. It has been designed with a ball drain so draining the tank will be quick and in-depth. Obviously, DEWALT D55140 is not the type of air compressor you can use as the centerpiece of an industrial unit or commercial workshop but for your do-it-yourself woodworking or carpentry projects as well as installation works around the house, this Small but Powerful Air Compressor will definitely be a good investment. Viair 00088 88P is budget-friendly and has thousands of happy customers all over. This is a good combination that you will never find from any cheap air compressors. Anyway, this 12V air compressor has been designed for small trucks, SUVs, ATVs, and generally small cars. This is actually a really small unit, weighing under 5 lbs, so it’s also one of the lightest among the list. It can comfortably fit in any small spaces and can be easily stored. But despite its small design, it really has a quite impressive performance. It has a 45% duty cycle so the compressor will be able to run at 30 PSI for up to 25 minutes before it needs to cool down for 35 minutes. You have the option to attach it directly to the battery so you no longer have to worry about its power source. It uses high-grade alligator clamps that work really well. It tightly fits on your battery, so you no longer need to worry about any cheap plastic options that easily slips off. It comes in a heavy-duty design and has a long piston stroke to make sure it will not vibrate as loudly or violently as most compressors. A heat sink has been integrated on its piston head that does a really good job in helping this compressor keep its cool. 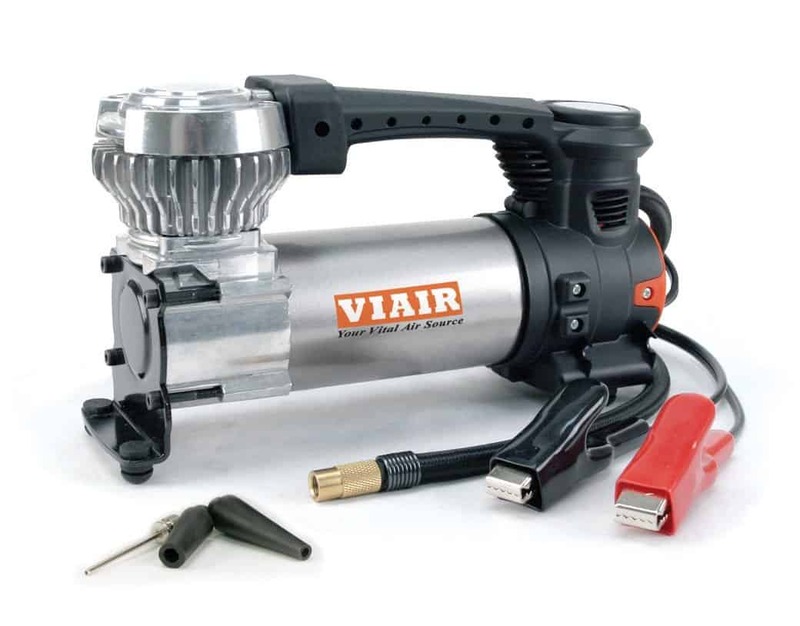 Overall, Viair 00088 88P is a good choice, especially if you are looking for an Affordable Portable Air Compressor without spending too much money. After reading the reviews above, I’m sure you’ve noticed how these air compressors come with different features and specs. So to be able to choose the best small air compressor for you, it is very important to consider these features accordingly. For instance, if you want something that is portable and easy to store, you should know that weight is not the only factor, shape matters too. 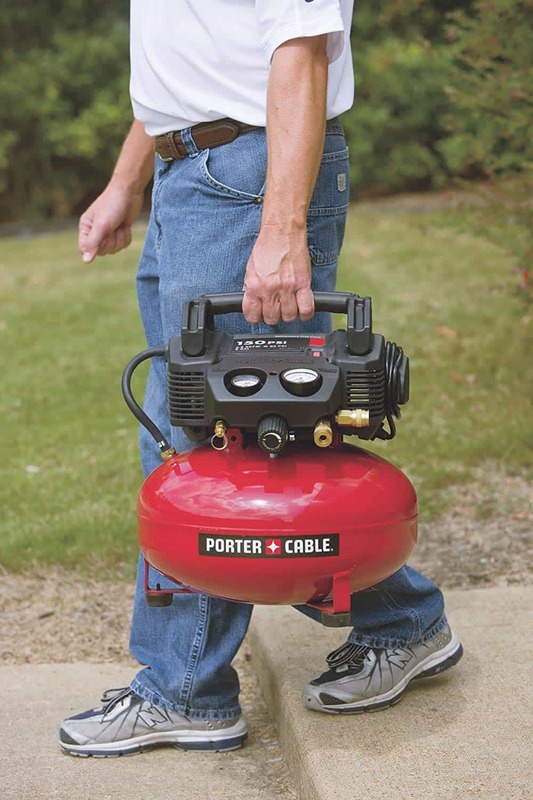 A slim, small air compressor unit is the easiest to store and carry around while wide ones are the most awkward. Some compressors also come with a handle to make it easier to carry and some even come with wheel kits. Another important feature you need to consider is the Cubic Feet per Minute (CFM) and tank size. The CFM is about how fast it is for the compressor to supply air. Of course, you don’t want your tools to use air more rapidly than your compressor can provide or else you will be waiting around a lot and that would not be productive. Moreover, for a small compressor, a six-gallon tank is the sweet spot for most consumers. This will be enough to perform almost any task like running two nail guns at a fast pace without breaking a sweat. Two and three-gallon tanks, on the other hand, are also sufficient if you are planning to only drive a few nails on a rare occasion or when you just want to fill up your bicycle tire. You should also be aware of the equipment’s safety features. It is very important for an air compressor to come with safety shut-off features just in case the air compressor overheats. It should also have a solid foundation and has an appropriate length of power cord so that you can keep it at a safe distance away from other objects. For home use, a quiet compressor will provide convenience and your family will absolutely appreciate it. Some compressors can be extremely loud and this can impact your environment, especially if you are living in an area where your neighbors are close by. Noise levels vary widely between models from around 55 dB, which is considered to be used safely without ear protection, to more than 80 dB which can cause irreversible damage to a person upon prolonged exposure. While you are here, why not check out these reviews on the Best Small Pressure Washers. You will never know the benefits of owning a small air compressor until you own one. The suitability of an air compressor will largely depend on the type of jobs you are planning to do. 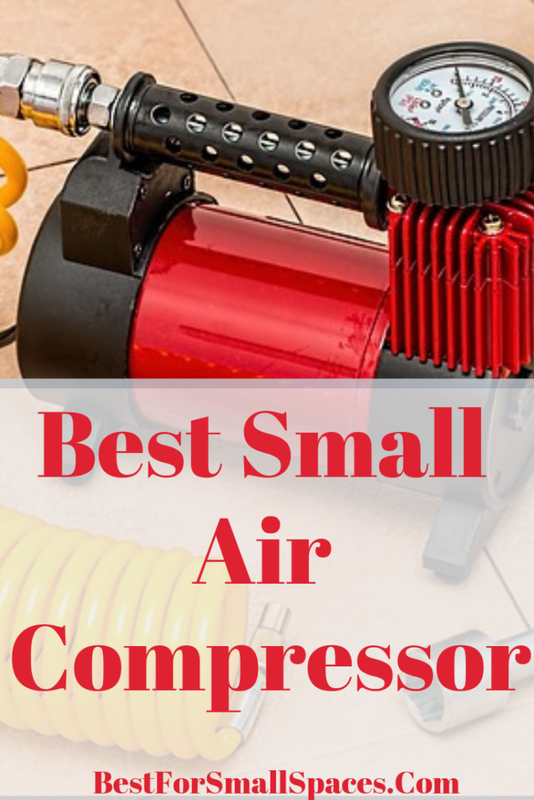 So I hope this article on the Best Small Air Compressor 2019 will help you find one that will suit your needs and all the jobs you want to accomplish.